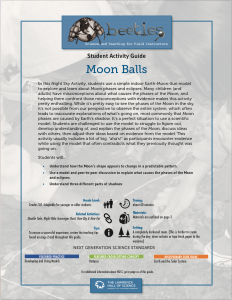 In this Night Sky Activity, students use a simple indoor Earth-Moon-Sun model to explore and learn about Moon phases and eclipses. Many children (and adults) have misconceptions about what causes the phases of the Moon, and helping them confront those misconceptions with evidence makes this activity pretty enthralling. While it’s pretty easy to see the phases of the Moon in the sky, it’s not possible from our perspective to observe the entire system, which often leads to inaccurate explanations of what’s going on, most commonly that Moon phases are caused by Earth’s shadow. It’s a perfect situation to use a scientific model. Students are challenged to use the model to struggle to figure out, develop understanding of, and explain the phases of the Moon, discuss ideas with others, then adjust their ideas based on evidence from the model. This activity usually includes a lot of big, “aha’s!” as participants encounter evidence while using the model that often contradicts what they previously thought was going on. Understand how the Moon’s shape appears to change in a predictable pattern. Use a model and peer-to-peer discussion to explain what causes the phases of the Moon and eclipses. Understand three different parts of shadows.